I’ve made this recipe at least five times now and I am very excited to finally share it. This bread is perfect for sandwiches, toast or as a snack on it’s own. It was also a hit served with soup and chili. 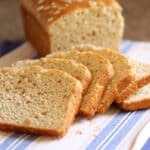 * If you enjoy step by step photos, there are photos included in my original Gluten Free Sandwich Bread post. This dough appears the same in each stage and the photos can be used for reference. Place the flours, starch, yeast, salt and xanthan gum in a mixing bowl, or the bowl of your stand mixer. Warm the butter and honey in a glass bowl or cup until the butter is melted. Whisk or stir it together and set aside. Using an electric mixer (hand mixer, or stand), gradually beat the warm milk into the dry ingredients. The mixture will be crumbly at first, but once all the milk is added, it’ll come together. Add the melted butter and honey to the mixing bowl and beat until thoroughly blended. Add the eggs, one at a time. Beat the mixture till each egg is thoroughly integrated before adding the next one. Once you’ve added all the eggs, beat the mixture at high speed for 3 minutes. This adds air to the thick batter, which helps take the place of the missing gluten as far as structure is concerned. At the end of 3 minutes, the batter will look like thick, heavy buttercream icing: smooth and silky. The dough will also be very sticky, and feel a bit gritty if you rub some between your fingers. Leave the batter right in the mixing bowl and cover the bowl with a light cloth or plastic wrap. Let the thick batter rise for 60-90 minutes. This batter won’t double in size, but it’ll definitely puff up. Gently stir the batter down. Scrape it into a lightly greased 8 1/2” x 4 1/2” loaf pan. Use your wet fingers, or a wet spatula or bowl scraper, to smooth the top, eliminating any “wrinkles.” The smoother your loaf is before you put it into the oven, the smoother it’ll be once it’s baked. Lightly sprinkle the top of the loaf with oats and press lightly into the loaf. Loosely cover the pan and let the dough rise till it barely crowns over the rim of the pan. 45 – 60 minutes, as much as 90. Towards the end of the rising time, preheat the oven to 350°F. Bake the bread for 25 minutes, until golden brown. Remove it from the oven, and turn it out of the pan onto a rack. 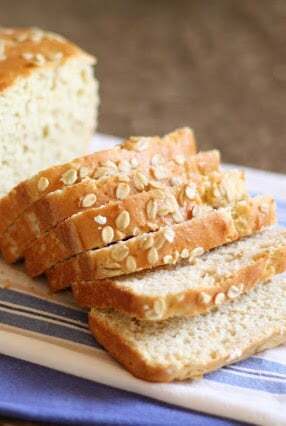 Lightly brush with melted butter to help keep the crust soft, being careful not to brush off the sprinkling of oats. Slice when completely cool. Enjoy! Dinner rolls bake in 18-22 minutes. A loaf of bread generally takes 45 to 55 minutes. While a small loaf could bake in 25 minutes, I suspect this is a case of a typo. If you have an instant read thermometer, the internal temperature should be, depending on the recipe, between 195* and 210* Fahrenheit. If you bake in a clear glass Pyrex loaf pan, you can see the brown crust on the sides and bottom. I made this recipe. I baked it for 35 minutes and it wasn't done. 10 more minutes and it reads at least 190 degrees...i stopped when it reached that point because the top and all sides had nicely browned crust. After you've made the same recipe a few times, you'll know how long it needs. Best wishes. I’m allergic to gums Does it really need it for this bread to turn out Was thinking chia or flax to replace xantam gum. Any suggestions? I honestly can't speak to that. I don't have a lot of experience baking breads without them. That said, there are a lot of comments on this post with different adaptations readers have made. It's likely worth reading through to see how it has worked for others. I just read that pectin can be used instead of gums... Might be worth a try! I just posted this in a longer post but you can use Pamela's Not Xanthan Not Gum binding mix. Worked great. My cousin is gluten free and cannot have eggs. This is my favorite gluten free recipe ever. Have you attempted this recipe with an egg replacer? Thanks! I am wondering this too! I just tried it with Ener- g egg replacer and it worked great. That's good to know! Thanks for your help, Stephanie. So good! A bit more of a sweet oatmeal muffin than I expected, but so delicious everyone keeps stealing my GF bread! I didn't have the brown, so I went with the white rice flour. One thing I really appreciated that you did was you discussed the texture of the dough before the first rise as a buttercream frosting. I live in the desert and would you believe I had to add in a few tablespoons of water to get to that texture? I had more of a cookie dough texture before adding the water, but I knew it was not as it should have been, so I was able to make an informed decision! Thank you. I would definitely suggest to others to add a bit of water a T at a time in case they're on the dry side (and this is something I almost always have to do for most recipes, everything here is dry, dry dry! )Also, I've made some GF bread recipes but this is the only one that uses a 3 minute electric mixer extra whipping to add some air. No one is doing this, and I think it's a great innovation, to add some air by hand. Thanks, very good research on this one! This recipe is great! I had to make some modifications for allergies, and ended up with:160 g (1 cup) brown rice flour 150 g (1 1/4 cup) cups gf oat flour 100 g arrowroot starch 44 g sweet rice flour 1 package red star instant yeast 1 1/4 teaspoons salt 1 tsp guar gum 1 tsp unflavored gelatin 1 tbsp white sugar 8 oz warm milk, 110 degrees 1/3 cup honey 4 tbsp melted butter 3 large eggsI added the sugar because I forgot about the recipe using honey; just including it here to be thorough.Unlike a lot of gf breads I have tried, this one isn't liquidy, and it rises straight up. I put it in the oven too early, convinced I was about to have a huge mess if it rose over the edge. It kept rising and stayed in the pan! It did end up heavier/denser than the one in the photo. Still delicious though :)Loved eating this toasted with a sunny-side up egg on top this morning. So delicious! Almost forgot - I noticed someone else had issues with the time. I agree it's probably a typo. My bake time was closer to 50 minutes. I tented it at the 25 minute mark, but would probably do it after 20 minutes in the future. When I took the bread out to cool, the thermometer was reading around 206°F. Hope this helps! Me again :) This has become a go-to recipe for me. Here are some things I have learned while making this bread. 1) The pan is really important! I used to use glass, but I switched to metal and it is much better. The loaf heats faster and rises more evenly, and the pan cools down after you remove it from the oven (which keeps it from drying out). 2) An old recipe I used suggested starting at 375 F, then reducing to 350 F when you tent the bread with foil (about 20 minutes into cooking). I strongly prefer this method. 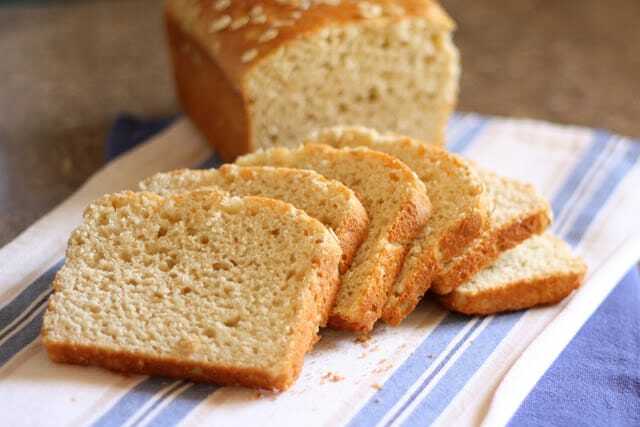 3) I modified this recipe and used baking soda and lemon juice, to make a quick bread (I have an autoimmune disorder/allergy problems and have to make everything at home, so having a recipe that I can throw together quickly is really nice). My final recipe is: 160 g (1 cup) Brown Rice Flour, 150 g (1.25 cup) GF Oat Flour, 44 g White Rice Flour, 100 g Arrowroot Starch, 39 g (6 tbsp) Ground Flax Seeds, 1.25 tsp Sea Salt, 1 tsp Baking Soda, 12 oz Whole Milk, 4 tbsp Olive Oil, 60 g Honey, 3 Large Eggs, and 4 tsp Lemon Juice. I mix all the dry ingredients in a bowl, then add the wet. Eggs go in one at a time, and Lemon Juice goes in last. Oh and I almost forgot - weigh the ingredients! It's way less cleanup, and is more accurate. Thanks so much for posting this. I would not have been able to make this bread without this post!!! This is a wonderful bread! Tastes and looks like normal bread! Thank you so much for sharing it! We have a few allergies, so I used golden flaxmeal to replace the eggs and also dairy alternatives, and it still turned out beautifully! I'm thrilled that you like it! Wow oh wow, bread again. I could dance right now. This recipe is amazing. But even better is the fact that I made it whole food plant based (vegan) I cannot have oils/dairy/xanthan gum/eggs. So for those of you wondering, here is what I did. I kept all the flours and starches the same. I used Pamalas Not Xanthan Not Gum baking binder (2 Tbs) in place of xanthan gum. Then I used Ener-g egg replacer for the 3 eggs and almond milk for the reg milk Lastly I used 1/4 cup of unsweet applesauce in place of the butter. I followed the recipe exactly for the mixing and baking. (Except yeah you need 45 to 50 min for baking) So for those of you who have food sensitivities there is hope!! Thank you Mary!!! I am absolutely thrilled that you loved the bread, Stephanie. Thanks for sharing your adaptation! I am gf & also dairy free & my daughter has a dairy allergy as well . We’d love to try this recipe but we’re wondering if you have any suggestions on what we could sub for the milk?? A few people have left comments with substitutions that work. If I recall correctly, almond milk and dairy-free butter has been substituted without problems. It might be worth scanning through the comments for more ideas before trying it. Good luck, April! Excellent bread! Will make again. Has anyone tried only one rising? I'm thrilled that you like the bread, Carolyn.